Try these Yosemite National Park activities on your vacation in Yosemite California. The sights are spectacular. Your visit to Yosemite should include a visit to Glacier Point, Yosemite waterfalls (Yosemite Falls and Bridalveil Fall), Tunnel View, Yosemite Valley, and Mariposa Grove of Big Trees. You may wish to spend an entire week in Yosemite, or just visit for a weekend getaway. Glacier Point offers breathtaking views of Yosemite. Your Yosemite vacation must include a trip to Glacier Point, located 3000 feet above the valley floor. You can see Half Dome, Vernal Fall and Nevada Fall, and a panoramic view of much of Yosemite National Park. Many famous Yosemite pictures were taken from Glacier Point. You can watch the spectacular sunset from Glacier Point Yosemite, and during the summer months, the national park service rangers put on an evening star gazing show after you watch the sunset. This is one of the best Yosemite National Park activities! If you don’t want to drive these winding narrow roads yourself, the Yosemite National Park Service offers daily guided sightseeing tours by bus. Note that the road to Glacier Point is closed during the winter. Yosemite waterfalls are a must see when you visit Yosemite. The waterfalls are most spectacular during the spring, when the snow melt is rushing down the creeks and over the falls. During the summer the waterfalls get less water, and may reduce to a trickle during the fall and winter. 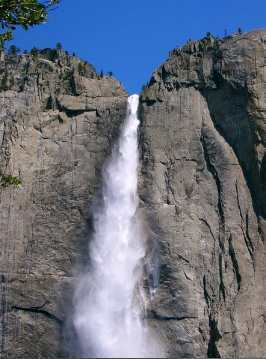 The Yosemite Falls is located in the valley near Yosemite Lodge. The hike to the lower falls is an easy 15 minute walk. If you wish to hike to the upper falls, the hike is around 4 miles. Access is steep and slippery. Bridalveil Fall is another beautiful waterfall, located in Yosemite Valley at the highway 41 juncture. This fall may be seen from the parking lot, and a closer view from the end of a 1000 foot hiking trail. Additional waterfalls can be seen from Glacier Point. Seeing these beautiful watefalls in the backdrop of Yosemite California is one of the must see Yosemite National Park activities. There are many Yosemite lodging choices near Yosemite Valley, including camping. Tunnel View offers a great opportunity to take some Yosemite pictures with a postcard view of Yosemite Valley. The tunnel view is located on highway 41 just a short drive up from Yosemite Valley. If you are entering Yosemite Valley from the southern route, or visit Glacier Point, you will see the tunnel view as you return to the valley floor. You can also take an easy hike to the old Inspiration Point from here to take some more Yosemite pictures. You will also want to bring take more Yosemite pictures in Yosemite Valley, and pretty much all the other places you visit during your vacation in Yosemite California. 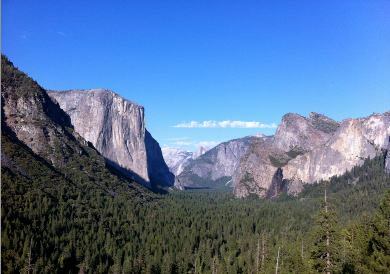 Yosemite Valley sightseeing is a must for your Yosemite California vacation. Yosemite Village is fun to explore, located a short walk from Yosemite Lodge, the Ahwahnee hotel and Curry Village. Enjoy a pizza at Degnan's, visit the Ansel Adams art gallery, shop at the Yosemite store, get your wilderness permit, see the Yosemite museum and more. A free Yosemite shuttle bus is available to take you around Yosemite Valley, and in the summer, to El Capitan. 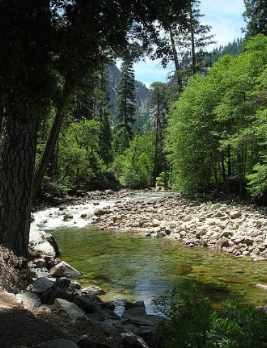 The Merced River runs through the center of Yosemite valley and is great to play in on a hot summer day. In late May to July you can rent a raft for a 3 mile float down the Merced river. For some free fun in the river, one of the best places is Yellow Pine beach?? ?, located on the Yosemite floor a few miles from Yosemite Village. You can splash and float in this calm section of river, or relax on the sandy beaches and enjoy a picnic lunch. Guided Sightseeing Tours of Yosemite are offered throughout the late spring to early fall. 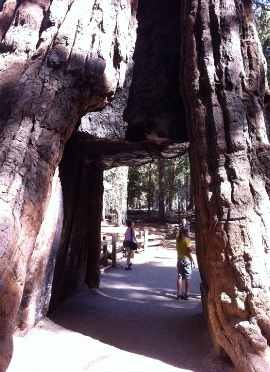 Tour options include a 2 hour Valley Floor tour, 4 hour Glacier Point tour, 8 hour grand tour of popular sites, and the 1 1/4 hour Mariposa Grove Big Trees tram tour. 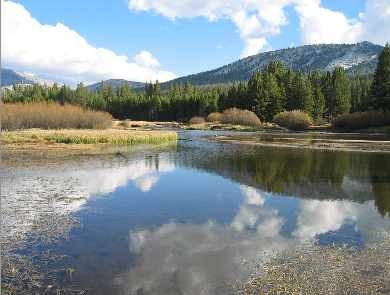 There is also a Tuolumne Meadows tour and hikers bus available. Mariposa Grove of Big Trees is one of the popular destinations in Yosemite park. Mariposa Grove has some of the best giant redwood trees in California. These giant redwoods are the largest trees in the world. You can hike through the grove, or take a 1 1/4 hour tram ride through the trees. This tram ride includes an audio tour available in multiple languages. The redwood groves are open late spring through early fall, weather permitting. This is another one of the best Yosemite National Park activities, especially if you have never seen giant redwood trees. Backpacking in Yosemite National Park is popular during late spring to early fall. Most of Yosemite is a wilderness area, viewed only by backpackers. You can backpack from Yosemite Valley, take a one way or round trip shuttle up Tioga Road through Yosemite to your trailhead, or leave from one of the many trailheads throughout the park, including the higher elevations around Tuolumne Meadows and Tioga Pass. Wilderness permits are required. For more information about backpacking in Yosemite see http://www.nps.gov/yose/planyourvisit/backpacking.htm. In the winter, you have the opportunity to ski Yosemite. 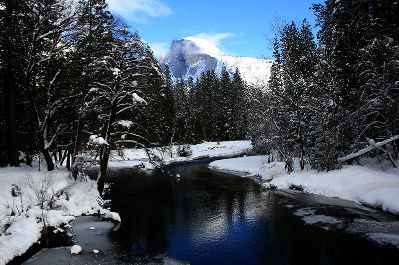 Skiing and winter sports are popular in Yosemite Valley, weather permitting. Badger Pass ski resort offers downhill skiing, snowboarding, cross country skiing and snow shoeing. Curry Village also has an outdoor ice skating rink open in the winter months. Tuolumne Meadows in upper Yosemite offers beautiful views, wild flowers and many hiking trails to enjoy. You can also continue up Tioga Road over the pass, and exit Yosemite through the eastern side to highway 395. The pass is closed during the winter. Swimming is an option at the Yosemite Lodge swimming pool, open in the summer months. Other swimming pools are available at the other Yosemite hotels, including the Ahwahnee hotel (hotel guests only), Curry Village, and Wawona hotel. You can also swim at a swimming hole in the Merced river running through Yosemite valley. Bicycling is popular on the flat Yosemite Valley floor, with its bike lanes and paths along the river and Yosemite Village. You may bring your own bike or rent bicycles at Yosemite Lodge or Curry Village. Horsebackriding is popular on some trails in Yosemite California. You may rent horses for a guided horseback ride at Yosemite Valley Stable, Wawona Stable, and Tuolumne Meadows Stables from late spring to September (dates depend on location and weather). Yosemite outdoor adventures are varied. Other Yosemite activities for those with an adventuresome spirit include rock climbing, hang gliding, backpacking and more. Check out our maps of Yosemite to help plan your vacation.